I woke up one morning a couple of weeks ago with another recipe in my head. Nutty! The Sassy Chef is in a particularly creative cooking mode lately! It’s weird but welcome. This recipe came out extra yummy and was surprisingly filling. Cut into quarters, it was one of my entrees at the PB&J party. Preheat oven to 400 degrees and mist a pizza pan with olive oil cooking spray. Mix diced chicken with veggies and microwave for 30 seconds. Stir to blend. Pour butter sauce from veggies into separate microwavable bowl and mix peanut butter into it. Microwave for 15 seconds and stir to blend fully. Thin apricot preserves with water and warm for 15 seconds in the microwave. Spoon peanut butter sauce on Naan. 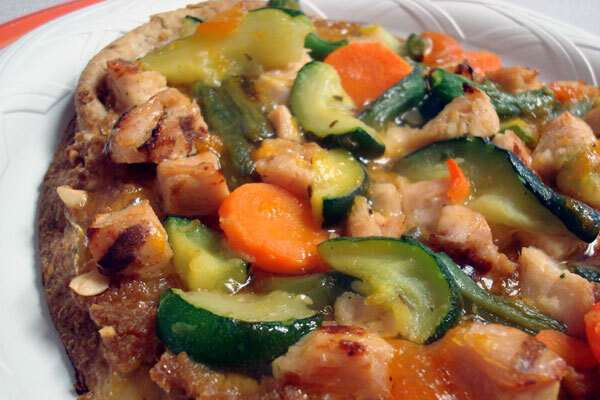 Spoon veggies and chicken on peanut butter-topped Naan. Drizzle thinned apricot preserves over veggies. Entry filed under: clean eating, food review, recipes. Tags: eat clean pizza, veggie pizza.